It’s an old saying – but a true one – that a picture is worth a thousand words. This is why, whether the company we are working with is an internationally renowned brand, a small start-up or a local charity, we advise all our clients to ensure they have good photography. The first step to good photography is a photographer you can trust! At Gecko we have worked with some great photographers, who have created eye-catching images, which have helped our clients to gain editorial coverage in all kinds of media from beauty and the dirt to The Wolverhampton Express and Star, and everything in between! 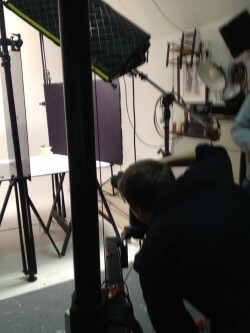 Last week, we were in Martin Cleveland‘s studio with some of our favourite people creating some fabulous images. First Tom from Shaken and Stirred, who has created some delicious, new cocktails from simple ingredients, mixed up the first of his scrumptious drinks. 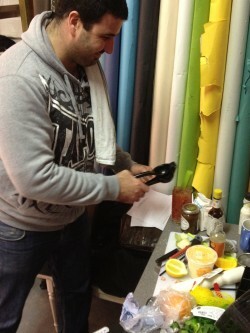 Tom, of Shaken and Stirred, Mixing It Up! Next up Gecko was in charge of props, styling and art direction. The aim was to create simple, ‘clean’ and effective photography that could be used in both consumer and trade media. Working quickly and efficiently, we managed to shoot eight separate cocktails, for various uses (cut out, styled, quirky angle, etc) in just half a day. 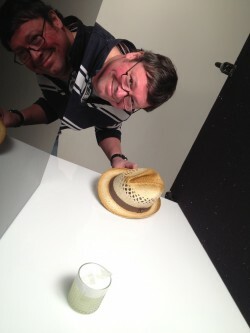 Like one of Shaken and Stirred’s cocktails at times it was Mayhem… but good fun – with some fantastic final results! 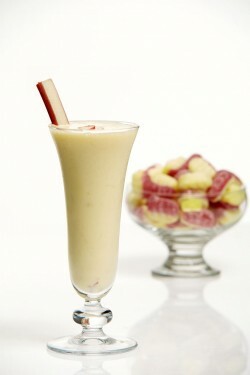 Here’s one of the images we created for Shaken and Stirred, The Rhubarb and Custard Sweet Treat – it contains CUSTARD!!! If you’d like to get your products into the media (or create images for your website, newsletters, exhibition stand or really any reason) and would like us to help you with your photography (we know some great photographers and stylists) get in contact, we’d love to hear from you. For our next post – and our readers delectation – we’ll be posting more images and the recipes for some of Shaken and Stirred’s fabulous cocktails.